A grand opening event and ribbon cutting ceremony to celebrate the restoration of the Port Memorial and the refurbishment of the whole area took place on Saturday 11 April 2015. The Town Band welcomed the crowd with lively tunes and a splendid ribbon and bow adorned the Port Memorial Monument. The sun shone and the crowd looked on as the Town Crier rang his bell and made a heartfelt and extensive proclamation about the town of Bideford. The history of the Port Memorial was then explained, and the ribbon and bow were cut. The silver Galleon which had been presented to the Town Council in 1928 by Sir Basil Peto when Port Status was re-instated made a very rare outing and was displayed during the ceremony, albeit carefully guarded by the Town’s Beadles! Today the ship takes pride of place at civic events, but was on display on Saturday alongside the silver rose bowl, from which non-alcoholic punch was served to all those attending the event. The terracotta plaques, now adorning either side of the Memorial, were designed and created by local artist Maggie Curtis and were the subject of great admiration and wonderment. They depict aspects of the fishing and shipping history of the Town and are well worth a visit. To find out more about how the plaques were made and the images depicted on the plaques please visit Maggie's website: www.maggiecurtis.co.uk/trade-maps A further plaque denoting the Bideford, Westward Ho! & Appledore Railway that used to run across the site, will be affixed to the Art School wall and an interpretation board is also planned. The regeneration of the Port Memorial Gardens was a Town Council led initiative but has been made possible thanks to funding from The European Fisheries Fund through Northern Devon Flag, Bideford Town Council, Torridge District Council and Bideford Bridge Trust. In September 1881 the Customs authorities announced they were reducing the status of Bideford from a ‘Port’ to a ‘Creek’ owing to a decline in trade. 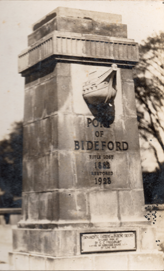 This meant Bideford would be subservient to the ‘Port’ of Barnstaple for customs collection and, as one might expect, this ‘created much feeling among all the intelligent people of the borough’ as the Western Morning News put it. The Town Council sent the then Mayor, Councillor T Wickham, and three councillors to meet the Lords of the Treasury, in London, to argue the case against this perceived slight but they refused to budge and ‘Port’ status was officially removed in 1882. This rankled and for many years the council tried to get the decision reversed and in this they were fortunate enough to find a shipowner who had been brought up in Appledore and who had first gone to sea in 1868 sailing out of Bideford. He prospered and from 1913 on he had registered every new ship he acquired at Bideford so that by 1928 some 33 vessels representing 271,000 tons deadweight were registered here, this being the largest tonnage for any port in Devon. 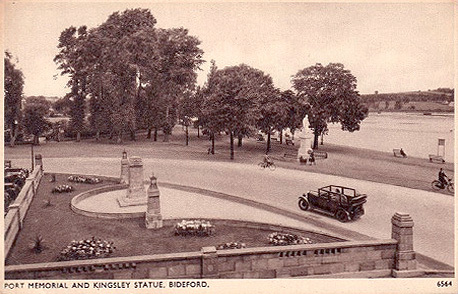 In 1928 Mayor Goaman, accompanied by Councillor Huxham- Smith and the local MP, Sir Basil Peto, went to London to meet with the Chancellor of the Exchequer, one Winston Churchill, who agreed to reinstate Bideford’s right to be a ‘Port’. Churchill’s wife Clementine is reported to have often visited her aunt who lived in Bridgeland Street and it is possible Winston had visited her here so he would have known Bideford; he did commission a bonnet for his first child from a Bideford lace maker Mrs Ellis who had a shop in Mill Street. Needless to say the Town celebrated its new status in style with Sir Basil Peto presenting the council with the silver model of a galleon, still proudly displayed on formal occasions. An illuminated copy of the Treasury Warrant was prepared at the Art School on the Quay and this was hung in a place of honour in the Town Hall. The occasion coincided with the centenary of the Appledore lifeboat station and the crew sailed up to Bideford and took the Mayor around the new ‘Port’. The following year Dr Precourt the Mayor of Biddeford in Maine, USA visited Bideford. This coincided with the opening of the new Pill car park and the ‘Ornamental Garden’ at the Quay end (the two cost £890 to lay out) and as a mark of respect Mayor Precourt was given the honour of opening them – with Bideford Band playing the ‘Star Spangled Banner’ in the background. The ‘Garden’ became known as the Port Memorial making a handsome addition to Bideford’s quayside.